With holidays making their way to our calendar nearly once a month, I started to make an easy treat that can be customized in many different ways. 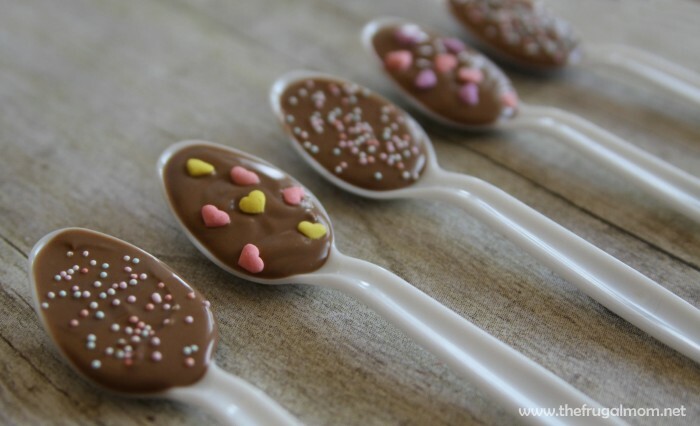 Since everyone likes a nice cup of hot chocolate or coffee, these chocolate spoons add just the right amount of flavor to warm up any afternoon. 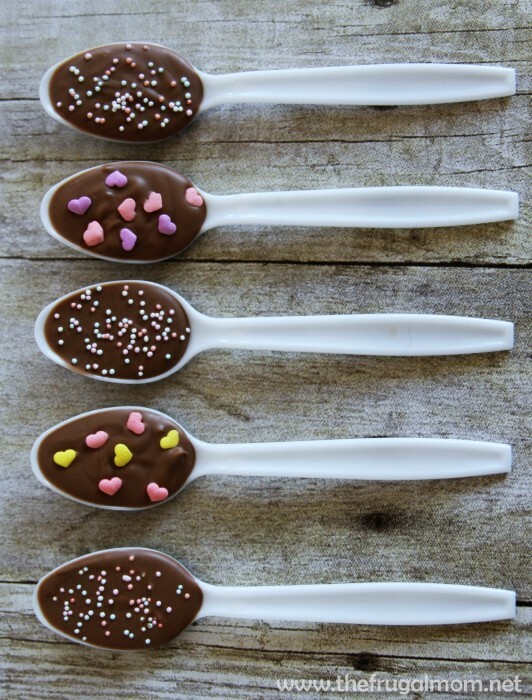 Since Valentine’s Day is right around the corner, I added pastel and heart shaped sprinkles to this batch of spoons, but you can add red and green for Christmas, orange and blue for a birthday party or purple, green and gold for Mardi Gras… the options are endless! (I have even tried marshmallow bits, caramel drizzles, chopped peppermints and mini chocolate chips!) I like to have fun with these and let my children each make their favorite! -Toppings: sprinkles, caramel drizzle, marshmallows, peppermints, cookies, etc. Add the melted almond bark to a ziploc bag, then cut a tip from the bottom corner. Lay the spoons in a row, for easy preparation before squeezing an ample amount of the almond bark onto each spoon. Let each spoon rest for about 10 seconds before gently shaking to smooth out the chocolatey layer. (Not necessary, but they will be prettier!) Add your desired toppings to each spoon, then let dry for 10 minutes. After the spoons have hardened, you can wrap the hot chocolate spoons in cellophane treat bags and add a cute note explaining their purpose. When you’re ready to use, just warm up some milk, hot chocolate or coffee and stir with this spoon! The chocolate coating will start to melt and fill your cup with just the right amount of flavor! These are so easy to make and loved as teacher gifts, birthday party treats and after-school snacks!